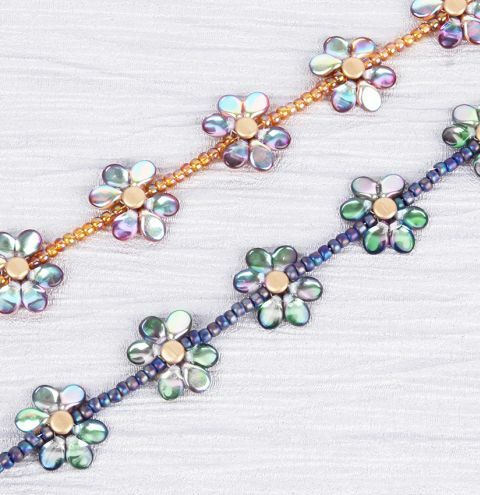 Create your own delicate floral bracelets using pretty pips, pellets and matching seed beads. Get all your materials for your two colourful bracelets in the 'Materials Needed' list. PLEASE NOTE - THE ORIGINAL PIP BEADS HAVE BEEN SWAPPED FOR AN ALTERNATIVE COLOUR. Thread the needle with an armspan of thread. String 10 x S, 1 x Pl and 10 x S.
Thread the needle through the first S and the Pl (see image). A loop of seed beads will be created, on which you will attach the fastening. Do not forget to tighten the thread when working. String 3 x P and once again thread the needle through the PL in the same direction as you did for your seed bead loop. String 3 x P again and thread the needle through the PL so that a flower is created. If you are using pip beads with a different colour on each side, line up the beads on your bead board where you want them to sit and thread through them in the correct direction. Check they are sitting correctly before continuing with your design. String 3 x P and thread the needle through the PL. You have created another flower. String 10 x S.
String 1 x PL and 3 x P again and thread the needle back through PL. Repeat the procedure according to until you have the 6 flowers. After achieving the required length of the bracelet, string 10 x S and thread the needle back through the PL. This will create a loop for the fastening. Sew the thread securely back into your bracelet and tie several knots as you go. Cut off the threads when you are happy your design is secure. Attach a jumpring through a seed bead on the end of your loop on each end. Attach a lobster clasp to one of your jumprings. You may wish to add an extension chain to make your bracelet adjustable.